Keywords moving in unison to achieve the business objectives. The user is the ball of course, and our ads work together to move the user down a sales funnel to the conversion goal. No team of keywords could represent this quite the 2016 San Antonio Spurs. A team of contradictions; they are old yet new, slow yet fast, defensive stalwarts yet prone to offensive outburst and fully adaptable. 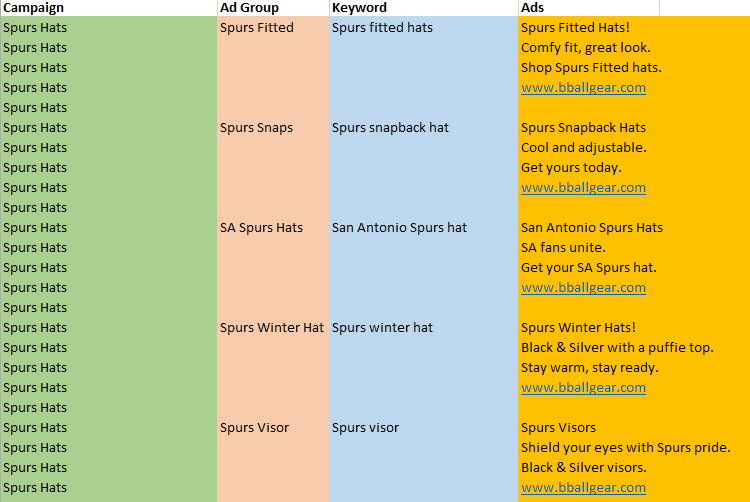 If my AdWords account could look like any NBA team, I’d want it to look like the Spurs. Keywords do a few important things in your paid advertising account. Yes, they spend your money, because a cost-per-click price is established on a keyword-by-keyword basis. When a user searches on an engine, your keyword is responsible for securing the click (and thus charging you the advertiser). 10-20 Keywords per ad group will work for 50% of advertisers. You will hear this at our AdWords training days as well, because it’s a great place to start! Newcomers to PPC often fill ad groups with +100 keywords, but this doesn’t work very well. What Google fails to mention above is that this really means no more than 10-20 keywords per ad group. Why? Well, because your ad group is really only serving one ad message (or two, if you are rotating and testing as suggested in this series), so that one single ad has to speak for all of your different keywords. AdWords’ Quality Score system loves it when your ad, your keyword & your landing page work in perfect harmony and are closely relevant. Too many keywords = too little relevance in your ad. The neglected function of the keyword is to serve your ad. When a user triggers a keyword in your paid account, Ad Group organization kicks in. Where did you stash your keyword? What is the relevant ad in that Ad Group? That’s the one that will show to a user. Keep this in mind as we review 4 levels of keyword segmentation that an advertiser could use to get results. They all have different merits. Each one utilizes a different max number of keywords per ad group. Each one also has i’s own highlight play that really embodies what’s happening in your AdWords account. Everyone’s first AdWords account ends up structured like this example. Again, nothing wrong here! This advertiser has lots of gear for sale and chose to segment ad groups by team. This will be a biiiiig campaign if they have 1 ad group for all 29 teams. 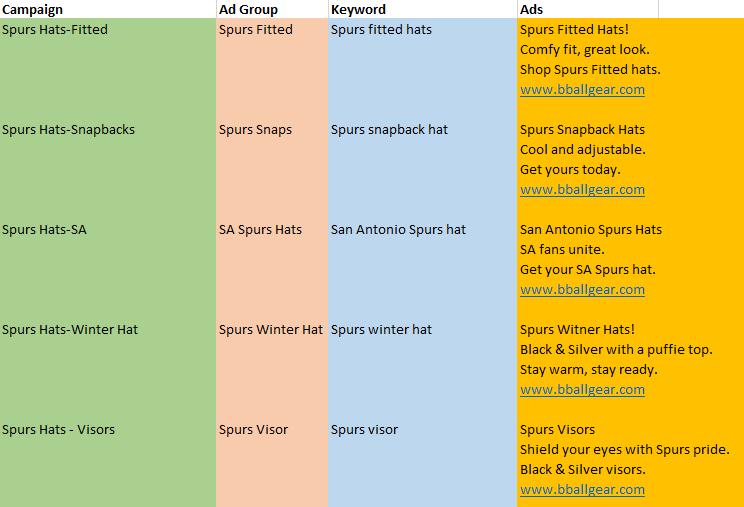 Segmenting the campaign by team means that all team-related keywords live in one ad group, and because they all live in one ad group, the advertiser can show one general ad. This one ad is all alone out there. It has to defend all user searches about Spurs merchandise. Just like Manu Ginobli on this chase down block. He’s out on an island and has to make a play. It’s a gamble. Maybe this ad is relevant to the user, maybe not. All of this advertiser’s eggs are in one metaphorical ad basket. If we break things down further by one level, and segment our campaigns by team, we can serve a much more specific ad. I love this level of segmentation. It can work for 90% of advertisers. Sure it takes a little more time, but the results are worth it. Now our ad groups are segmented by team and merchandise category. Look at our great ads! Someone searching for a spurs away jersey will trigger a really relevant ad. 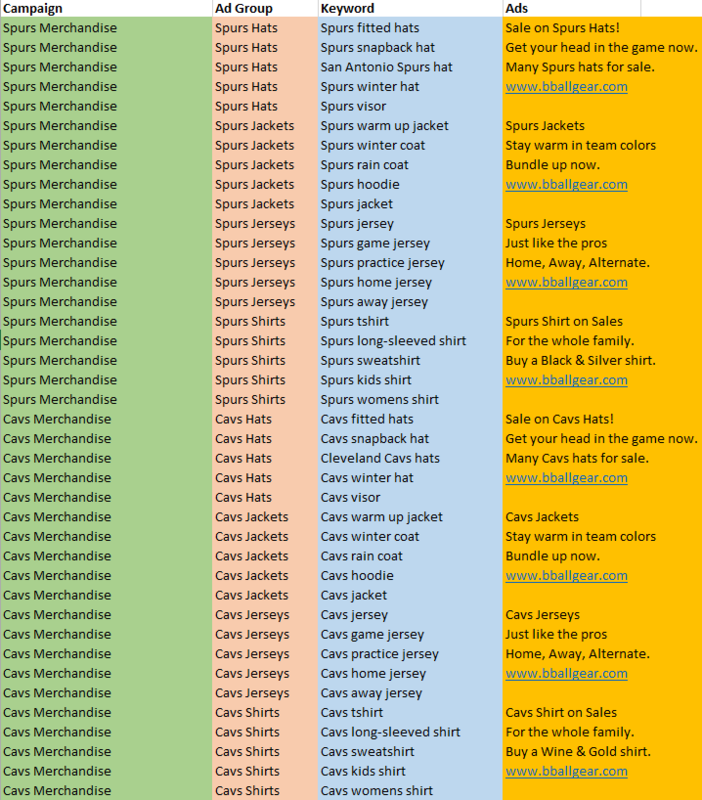 Don’t forget to add ad group-level negative keywords to each of your ad groups (for example, exclude “jersey”, “shirt, & “hoodie” from your Spurs Hats ad group). This ensures the teamwork approach. Practically, this will take a few more hours, but because we are trying to show the best ad for a user’s search, this is often necessary. Check out this 3-point line alley-oop from Tim Duncan to Kawai Leonard (not a household name by any means, but the subject of a recent FiveThityEight piece declaring him the most well-rounded 3-Point shooter since Larry Bird). Tim evaluates the floor, but sees a better opportunity to hit the conversion. The ad groups above make the right pass. If a user searches for a team coat, they get a coat ad. If they search for shirts, they get a shirt ad. The ad group structure & negative keywords help each other and make that key assist. Let’s keep breaking it down. 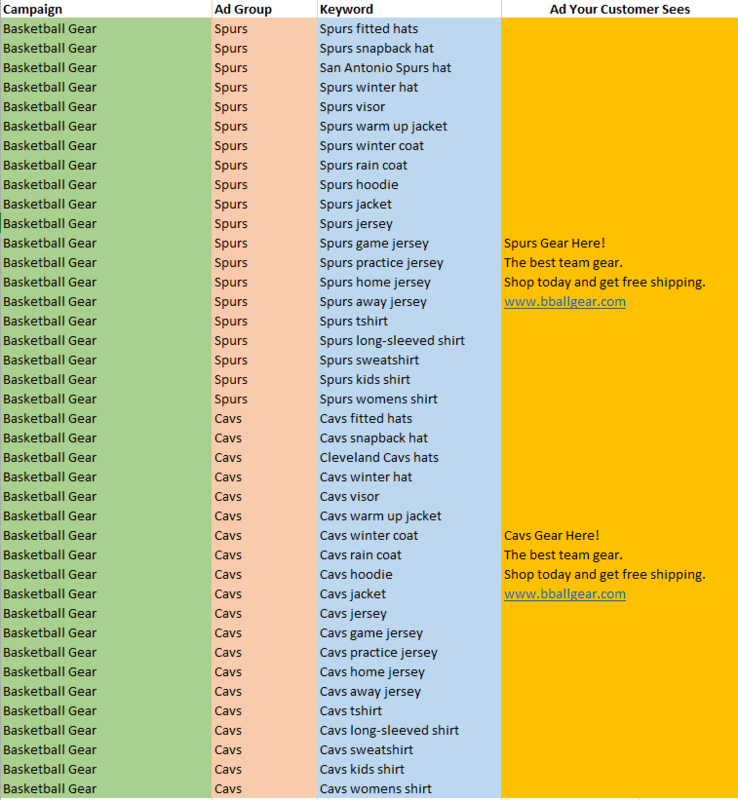 If we break our campaigns apart by Team + Merchandise Category, and then use only one keyword per ad group, this allows our ads to get really contextual. Now we are juking around all defenders to drop a hyper-relevant ad on an unsuspecting searcher. Just like legendary frenchman Tony Parker as he goes 2-on-1 and freezes Brandon Jennings & Andre Drummond while zig-zagging to the rack. Breakaway! What happens when you crunch your segmentation down as far as it will go? You get a fast break and a dunk or an easy layup. When you segment your campaigns down into small little bunches, and your ad groups only have one keyword, you are serving a hyper-relevant ad to your potential customer. Plus, you get the added ability to give daily budget to hot performing keywords. Budgets live at the campaign level, so doing this extra breakdown allows you to manage money like never before. This isn’t something I would recommend for an entire account, but rather when one or two hot keywords are using up an ad group’s budget. This cranks up your defense around the arc and gives you opportunity to run away with new business. Peep the 38 year old Argentinian wonder Manu Ginobili as he shocks young Marcus Smart with the steal and goes back for an easy to points. Defense leads to offense as you cherry-pick user searches and hit them with that perfect ad. Mix & Match! You can use any or all of these segmentation strategies in a paid account. How Many Keywords Should Be in Your Ad Groups? It depends! You can vary your level of ad control by changing your keyword count and applying these strategies. Will the Spurs be in the Finals this year? I think so. Want to Talk More About Ad Group Segmentation? Come to an AdWords Training or leave me a comment below.